Don't miss a new post! As online technology continues to advance and become more sophisticated, the pressure for businesses to adapt and keep pace is intense. From streamlining operations to meeting rising customer expectations, modern enterprises are turning to innovative software solutions for help. The main challenges are understanding what solutions to adopt and what areas to focus on improving. 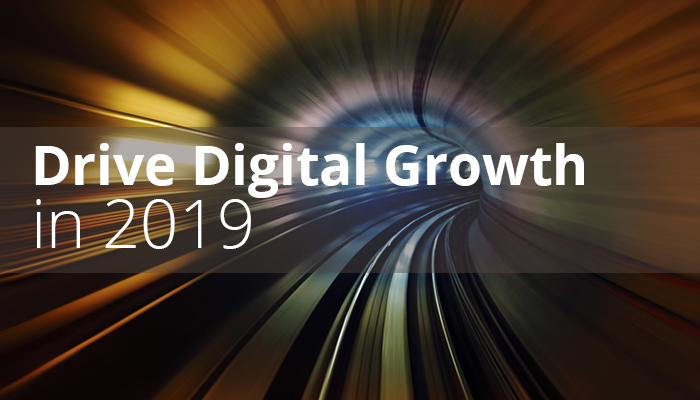 In an effort to help, let's examine three ways for businesses to drive digital growth in 2019. Businesses in every industry are being impacted by the mobile transformation taking place in the world. This isn't a huge surprise to modern enterprises, yet this awareness doesn't exactly mean businesses are ready for or taking advantage of the rapid progress of cloud and mobile computing technology. "According to Forrester Research, 30 percent of companies will see a decline in digital experience quality this year and, as a result, will lose a point in growth. And while IDC projects that $2.1 trillion will be spent on digital transformation by 2021, it also found more that more than 70 percent of organizations that have embarked on digital transformation journeys are stuck along the way, struggling to shift from being digital players to digital transformers or even disruptors." The struggle for modern enterprises to keep pace is real, as digital advances are progressing faster than legacy systems can be transformed. Much of this progress has to do with cloud and mobile computing solutions, which offer drastically improved functionality for operational workflows. "Mobile now accounts for nearly two-thirds of total digital ad revenue in the US. In HY 2018, mobile revenue jumped 42% year-over-year (YoY) to $31 billion. Desktop and mobile continue to rapidly swap places, as desktop's share further erodes and mobile's prominence grows." The rapid increase in mobile ad spending shows the growing importance for businesses to focus on improving their mobile capabilities for both operations and customer engagement. Both B2B and B2C companies must integrate mobile solutions to reflect this main change agent in 2019. "The average U.S. consumer checks their smartphone 47 times a day, giving marketers a chance to reach audiences dozens of times a week as people check social media, search online or watch videos on social media or streaming sites." Driving digital growth in 2019 means focusing on improving and integrating mobile solutions, in order to take advantage of these type of pronounced mobile trends. Whether businesses use mobile solutions to bring real-time accessibility to e-invoicing processes or to develop a mobile app to drive customer engagement, integrating mobile solutions should be a top priority. Focusing on improving customer experience (CX) is another way for businesses to drive digital growth in 2019. By expanding and optimizing customer portals, mobile applications, operational systems, and cloud capabilities, businesses will naturally enhance CX. For B2B companies, this means upgrading and digitizing processes with suppliers and distributors, and for B2C companies it means optimizing consumer endpoints and sales funnels. Basically, businesses must improve how they offer and deliver their services and products, in order to meet the rising expectations of consumers. Improving CX is a growing focus for modern enterprises as tech-savvy consumers become harder to engage and please. Additionally, retailers and distributors are asking more from their B2B partners, in order to meet their customers' rising expectations. "Modern technology has increased consumer expectations for things like selection, cost, shipping times and more. ...According to the report, eight in 10 Americans (81 percent) report that businesses are meeting or exceeding their expectations for service, compared to 67 percent in 2014. ...A key to providing good customer service for modern-day consumers is providing ample choice for contacting customer service. ...US consumers say they're willing to spend 17 percent more to do business with companies that deliver excellent service, up from 14 percent in 2014." On the whole, modern businesses are keeping pace with rising customer expectations, yet this doesn't mean they should rest on their laurels. Future innovations, and the subsequent changes in consumer behavior they create, will remain a challenge for modern enterprises to overcome. "By 2020, customer experience will overtake price and product as the key brand differentiator. And yet, only 58 percent of executives have a formal engagement program." Essentially, businesses that focus on solutions and strategies to improve CX will effectively drive digital growth in 2019. Businesses must continue to upgrade their legacy systems to accommodate digital growth in the coming years. Digitizing workflows and operational systems will streamline processes, increase productivity, expand capabilities, and prepare businesses for future growth. A business's capacity to integrate mobile solutions and improve CX depends largely on their operational capabilities. By digitizing legacy systems, businesses can tap into the power of automation, AI, and the cloud, in order to streamline operational workflows and expand their capabilities. "Whether you call it digital transformation, digitization, or DX, it's transforming companies of all sizes, across all industries. ...According to a 2018 survey conducted by Tech Pro Research, 70% of respondents noted that their companies either have a DX strategy or are working on one, and 53% reported that their DX budgets grew from 2016 to 2017. ...True digital transformation is a continuous process -- not one that is achieved or determined by a single technology. Success happens through an approach that embraces emerging technologies, innovation and disruptors as they pop up, with an outlook that matches curiosity with pragmatism." Indeed, the digital transformation is a process and not a single solution. During this ongoing process, executive leadership will continue to make important decisions on what solutions to adopt and what strategies to focus on. Effective solutions and strategies will work towards integrating mobile solutions, improving CX, and digitizing legacy systems. With the rapid rise of cloud and mobile computing technology, these 3 ways to drive digital growth will be vital for modern enterprises to realize in 2019. Finding the right partnerships to realize these goals is essential for modern businesses; when it comes to modernizing legacy systems, IN-COM can help streamline and optimize the process with the fastest code search and analysis platform in the industry. If you're interested in learning more, please contact us today. What are your digital priorities for 2019? Let us know in the comments. What is the SMART TS XL - Software Intelligence® platform? SMART TS XL is an application discovery platform that helps you understand and analyze all application assets. The patented Software Intelligence® technology gives you valuable insight into application architecture and helps you lower risk, improve productivity and reduce time to market. © IN-COM Data Systems. All Rights Reserved.